I personally dislike the screen's 18.5:9 aspect ratio. The LG G6 at least is adapted to the 18:9 (2:1) aspect ratio that is used for movies and series broadcasting, whether the Galaxy S8 just comes with an odd one which isn't compliant with any popular medium. The Galaxy S8 screen can adapt to those other popular aspect ratio and also play 16:9 content. You can even decide how you want the content to be displays. The thing is that Samsung should have used the 18:9 aspect ratio, and maybe this way this aspect ratio could become standard in many high-end smartphones in the near future, at least in high-end devices at first. Samsung is a smartphone manufacturer leader, which means that many other phone vendors follow its trends. I am really interested to see what screen aspect-ratio the iPhone 8 is going to have. If Apple goes with a 18:9 aspect ratio, many other phone manufacturers will follow it and I think that even Samsung will adapt to this exact 18:9 ratio for its future phones. As for now, I really don't understand why Samsung has chosen to go with that odd aspect ratio. Maybe because it wanted to make a devices with a taller screen and narrower compared to its competition. Of course dedicated per-installed Samsung apps will work wonderfully on the display because they are optimized for it. But just think of those third-party developers, which aspect ratio should they target their apps for? Exactly, it's confusing. As for now, most apps and games are targeted to the 16:9 aspect ratio, but this might change in the near future. With a new unique aspect ratio, this can make it hard for developers to decide which resolution to target their apps for or optimized their apps for it. This is why I really don't like Samsung going with a 18.5:9 aspect ratio with its Galaxy S8 smartphone. It will take some time until we get to see how this will affect app developers, but I'm pretty sure that what Apple chooses for its upcoming iPhones will have a higher weight than Samsung's. 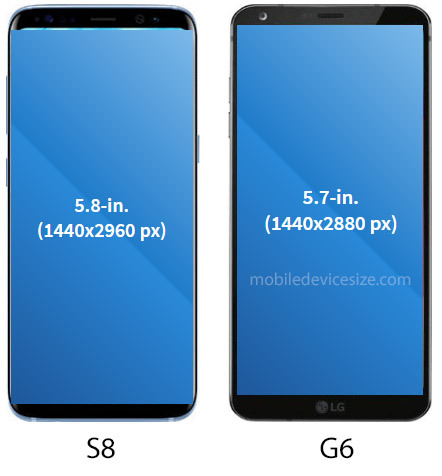 Just for comparison, the Samsung Galaxy S8 features a 5.8-inch with 1440 by 2960 screen resolution, whether the LG G6 features a 5.7-inch display with a 1440x2880 pixel screen resolution. You can see that the Galaxy S8 adds a bit more height resolution. The S8 has a slightly larger display, but has a narrower design (68.1mm vs 71.9mm, the height and depth are about the same 148.9mm vs 149.9mm and 8mm vs 7.9mm). I actually liked the reasons that LG G6 went with its 18:9 aspect ratio. At least it has good reasons to so. It's like Samsung said: "Hell no, this is not the aspect-ratio of the future, a 18.5-by-9 is". Of course this isn't the reason. Maybe because of the edge-to-edge design Samsung had to go with this noncomforming screen aspect ratio. As long as the screen can adapt to other resolutions without issues it might not be that of a big deal, but when it comes to displays, I think it's important to follow the normal conventions instead of deviating from it.